Enemy attempted to storm ATO positions in Avdiyivka. 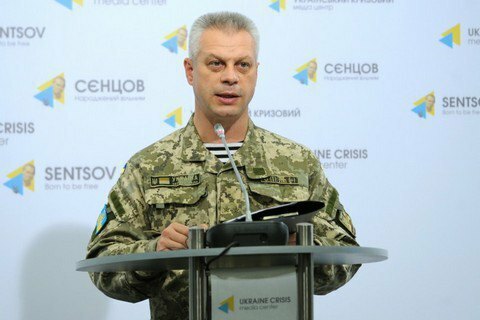 On 27 October, one Ukrainian soldier was killed and six were wounded in combat in Donbas, the press officer of the Ministry of Defense on the ATO Col. Andriy Lysenko told a briefing on 28 October. The enemy intensified attacks in the Avdiyivka-Opytne stretch. After dark, the enemy occupiers launched a series of mortar attacks in the area of Avdiyivka and the coalmine Butovka, and Opytne. The militants attempted to force the ATO troops from their positions in Avdiyivka. "The Russian command employed several hundred fighters from two different departments, several batteries of artillery and UAVs in this operation. After artillery preparation from 82-mm mortars and 152-mm artillery, the enemy tried to storm our positions. To repel the attack, reinforcement was called in reinforcement. The clash ended in our favour. The enemy did not pass," said the spokesman. After the clash, the enemy continued shelling the ATO forces from heavy weapons, firing over 300 of mortar shells and artillery rounds. On Wednesday, one Ukrainian soldier was killed and three wounded in Donbas hostilities. 72 fire attacks was reported on that day.